Zumba® - Drop the workout and join the party! The new face of fitness is a face that shouts, "I want to!" The new face of fitness is the face of joy, adventure and passion. Today, more than 12 million people all sizes, shapes and ages take weekly Zumba® classes in over 110,000 locations across more than 125 countries. And the program's popularity keeps growing by leaps, bounds (and exhilarating dance steps). People all over the world have fallen in love with the Zumba Fitness-Party™. I am a licensed Zumba® instructor now giving classes in Los Osos, California, in Zumba Fitness®, Zumba Toning® and Zumba Gold®. See about Zumba to learn more about Zumba. Classes are held both morning and evening in Los Osos. See schedule for exact times. Go to the location page for a map and directions. I am Peruvian and have been dancing to Latin Salsa music all my life. See about me to learn more. 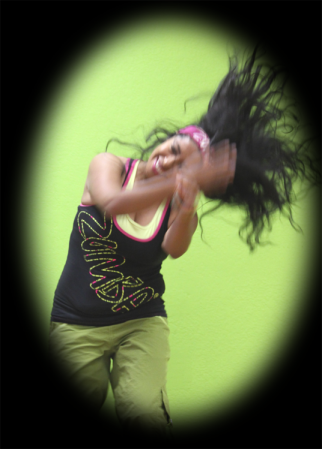 Here are some great photos of Zumba dance.